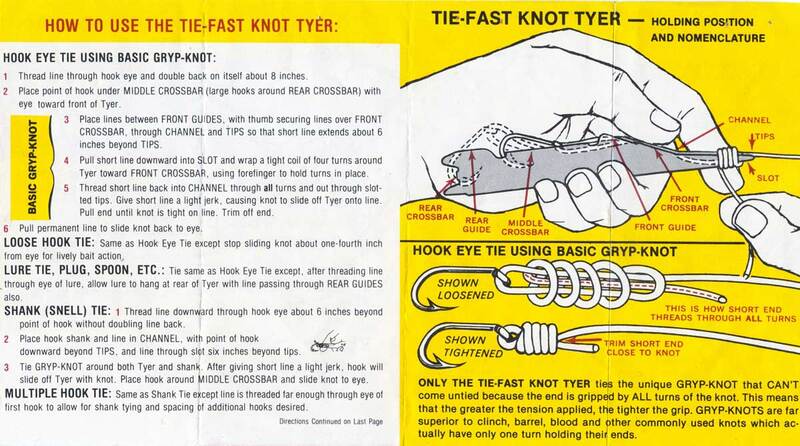 Video Description: Tie-Fast Knot Tyer. Small stainless steel tool that is used to tie the nail or tube knot in monofilament fishing line. 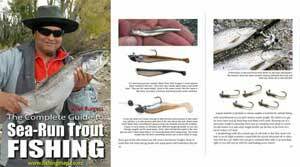 For tying the leader to fly line, splicing lines together, snelling hooks, and much more! 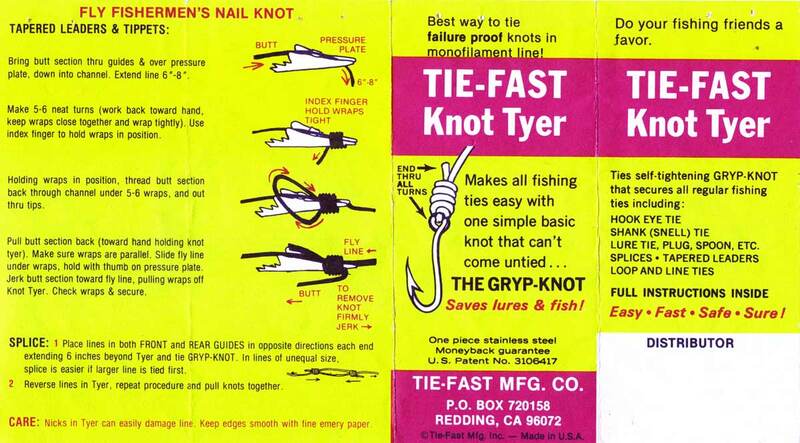 According to the manufacturer, the Tie-Fast is the best way to tie failure prove knots in monofilament line. With a little practice, it works very well. It can be used to tie mono to the hook eye and to swivels very quickly and easily. It also does a nice neat job. It is very good for tying a snell to the shank of any size hook, from very small nymphs and dry flies, all the way up to big tuna circle hooks and EZ Power-Baiter hooks. For larger hooks, I adapted the method to tie the hooks next to the channel as you can see in the video. Otherwise, the hook shank is too big. It completely blocks the channel, or grove, leaving no room for the monofilament to pass by the hook shank. There is apparently a Magnum version of the Tie-Fast tool which is 40 per cent larger but I have not seen it. The Tie-Fast can also be used to join or splice two lengths of monofilament together by simply tying back-to-back nail knots. It can also be used to effortlessly tie a leader to the end of your fly line. You can use the Tie-Fast to tie on any lure, plug or spoon quickly and easily. The obvious drawback is that it could easily be lost. Tying it to a piece of string around your neck would certainly help. Many anglers already carry line clippers, forceps for removing hooks from trout etc, around their necks so an additional tool probably wouldn’t make much difference. The Tie-Fast weighs just 11g so you wouldn’t know it was there. However, I wouldn’t wish to be reliant on it as my only means of tying knots. If you are just starting out as an angler you should still learn how to tie the Uni-Knot proficiently at the very least. If you have read my articles and watched my videos about surfcasting you’ll know that I am a strong advocate for pre-tying your rigs at home. Doing so not only saves time at the beach when you could be fishing it also allows you to tie your rigs up at a more leisurely pace. This is where the Tie-Fast comes and it’s own. Snelling hooks between small size 8 up to size 6/0 with the Tie-Fast is really fast and efficient. Hooks in these sizes fit in the channel well and monofilament up to 24kg (50lb) wraps around the front of the Tie-Fast effortlessly. The resulting nail, or tube knot is very strong because it locks the tag under all of the wraps. We would, of course, lubricate all these knots with saliva to prevent damage to the monofilament before pulling them up tight. I thought I would spare you that part in this instance. I have had two of these Tie-Fast tools for years. It must have been some time ago because I can’t remember where I got them from. It is only recently that I have started to use the Tie-Fast on a regular basis. It is a very good tool. I find it better and faster to use for snelling hooks than a short length of small diameter hollow fishing rod. See my video on the Tube Knot. The Tie-Fast is made the United States of America. Here is the Tie-Fast website. Kilwell Sports in Rotorua have a Tie-Fast Combo Tool. The instructions that come with the Tie-Fast. To see image full size, right click/open image in new tab. Improved Clinch Knot Video – This Knot is Used for Almost Everything!